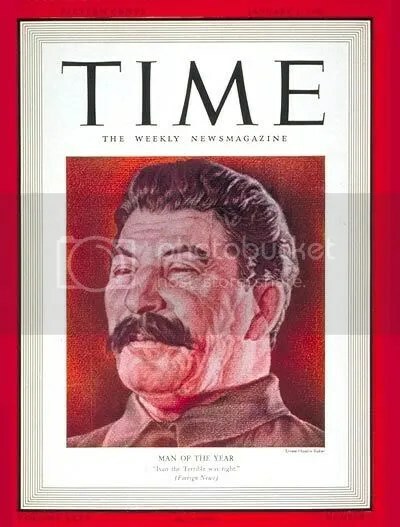 Time Magazine "Man of the Year 1940"
Time Magazine "Man of the Year 1942"
Since the Jesuits were behind the perfection of communism, should it come as a great surprise that Stalin was trained by Jesuits? During his childhood, Joseph was fascinated by stories he read telling of Georgian mountaineers who valiantly fought for Georgian independence. 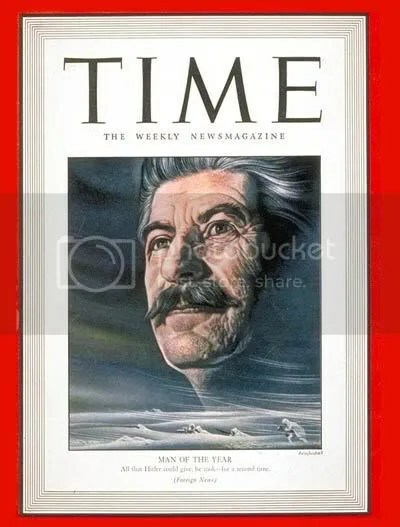 His favorite hero in these stories was a legendary mountain ranger named Koba, which became Stalin’s first alias as a revolutionary. He graduated first in his class and at the age of 14 he was awarded a scholarship to the Seminary of Tiflis (Tbilisi, Georgia), a Jesuit institution (one of his classmates was Krikor Bedros Aghajanian, the future Grégoire-Pierre Cardinal Agagianian, see ) which he attended from 1894 and onward. Although his mother wanted him to be a priest (even after he had become leader of the Soviet Union), he attended seminary not because of any religious vocation, but because of the lack of locally available university education. In addition to the small stipend from the scholarship Stalin was paid for singing in the choir. For more information on Stalin and other Jesuit trained movers and shakers, see the corresponding thread at davidicke.com. Fidel Castro was born in the village of Birán in Cuba on August 13, 1926 into a rich family, the son of Angel Castro, who was a Spanish immigrant, and his cook Lina Ruz Gonzalez. In his early life Fidel Castro went to Jesuit schools and from there he attended the Jesuit preparatory school Colegio Belen in Havana. In 1945 Castro went to the university of Havana to study law, he graduated in 1950. From 1950 to 1952 Fidel Castro used his training in law in a small partnership. Castro was intending to stand for parliament in 1952, but didn’t due to a cancellation in the election, by General Flugencio Batista. To the United States concern, Cuban Prime Minister, Fidel Castro and USSR Prime Minister became very close, and soon the USSR was sending great quantities on economic aid, as well as military aid from the USSR. On April 17, 1961, the United States sent a force of Cuban exiles trained by the CIA to south Cuba at the Bay of Pigs. The CIA assumed that this invasion would spark some interest in an uprising against Fidel Castro. There was no uprising but instead Castro’s forces apprehended the Cuban invaders, because President Kennedy backed out of the invasion at the last moment, so the invaders lost their support. On December 2 1961 Castro stated that Cuba was going to adopt Communism. Pope John XXIII excommunicated Castro. In October 1962 the Cuban missile crisis took place after the United States found that the Soviet Union was attempting to launch nuclear missiles in Cuba. After this short lived crisis the relationships between the United States and Cuba remained very mutual. The life of Fidel Castro has always been bound up with prophesies, some of them strangely accurate. Probably the most known is the one made by [Jesuit] Father Antonio Llorente, Castro’s teacher and spiritual adviser at the [Jesuit] Colegio de Belén. “Fidel Castro is a man of destiny,” prophesied Llorente. “Behind him is the hand of God. He has a mission to fulfill and he will fulfill it against all obstacles.” In this particular case, however, I have the feeling that Father Llorente was slightly confused about whose hand was behind Fidel Castro. Pedro Arrupe, Jesuit Superior General (1965 - 1983), boasted in an interview: "And what makes you think we are not proud of Fidel Castro?" Castro's teacher Fra. Armando Llorente, S.J., said: "Fidel Castro is a man of destiny. Behind him is the hand of God. He has a mission to fulfill and he will fulfill it against all obstacles." 1) Fidel Castro attended three Jesuit institutions. College Lasalle and Colegio Dolores. “Colegio” in Spanish is a high school or junior college. 2) He then attended a Jesuit university for “preparatory” studies–obviously, what we would call a “general studies” program–at Colegio Belen, “general studies,” because, after he matriculated from there, he went to law school. 3) Upon graduating from law school he joined the Orthodox or Christian Democrat party. My European readers will instantly recognize that this is the Roman Catholic Party. The first Christian Democrat party was begun in Italy under Pius XI in the 1920’s. Pius XI later disbanded that party, to put his full support behind Benito Mussolini and his Fascists. The leader of the Christian Democrat party was then forced into exile, though he and Pope XI remained on good speaking terms. It was in London that this leader met a fellow exile – Avro Manhattan. Returning to Fidel Castro : Castro was obviously fully working for the Jesuits when he joined the Christian Democrat party as a young lawyer. Not only that : by the time of the Cuban revolution in 1958-59, the Jesuits in Latin America were going fully Marxist-Leninist in ideology, as both Avro Manhattan and a former Jesuit priest, Malachi Martin, well document. Malachi Martin documents how that, in 1963, the Jesuits became fanatic, left-wing Communists, under Pedro Arrupe, himself a Marxist, and a great advocate of Fidel Castro. Martin documents in his book: “The Jesuits and the Betrayal of the Roman Catholic Church” how the Jesuits proceeded to foment Communist revolutions throughout Latin America and Africa, with Castro’s aid. Back to Castro and Communist Cuba : the “Calvary Contender,” an independent online Baptist periodical, reports that Henry Morris, the writer of the Genesis Flood, says that the Pope recently visited Cuba. He and Castro shared the same podium. Pope John Paul II sounded as Communist as Castro. Cuba is overwhelmingly Roman Catholic. Roman Catholics are allowed to join the atheist Communist Party. Fidel Castro himself is a graduate of several Jesuit institutions, and is in good standing with the Pope. He was a member of the Roman Catholic Christian Democrat party before starting his Marxist/Leninist revolution. For more references linking Castro with the Jesuit Order, see davidicke.com. This Youtubed documentary was spotted at the Unhived Mind II forums. Your research is great in teaching how the Jesuits Educate, Infiltrate and Agitate. One point you didn’t cover, is the Jesuits part in the American revolution. The American revolution was a masterful and brilliant accomplishment of the Jesuits. The sun “rises in the east,” and in the East is the place for the Worshipful Master. As the “SUN” is the source of all light and warmth, so should the worshipful master enliven and warm the brethren to their work. Among the ancient Egyptians the sun was the symbol of divine providence. The Sunburst of gilt (gold) embroidery on the back of the vestments of the Catholic Priesthood signify that the priest is also an EMISSARY AND REPRESENTATIVE OF “SOL INVICTUS” (THE INVINCIBLE SUN). Father Lang: In most major religions, the position taken in prayer and the layout of holy places is determined by a “sacred direction.” They saw in the “rising sun” a symbol of the Resurrection and Second Coming, and it was a matter of course for them to pray facing this direction. There is strong evidence of Eastward prayer in most parts of the Christian(r.c.) world from the second century onward. There is a close connection between Eastward prayer and the cross; (both being sun symbols) this is evident by the fourth century, if not earlier. In synagogues of this period, the corner with the receptacle for the torah scrolls indicated the direction of prayer–“qibla” toward Jerusalem. Among Christians (r.c.) it became a general custom to mark the direction of prayer with a cross on the east wall in the apses of basilicas as well as in private rooms, for example, of monks and solitaries. Toward the end of the first Millenium, we find theologians of different traditions noting that prayer Facing East is one of the practices distinguishing Christianity from the other religions of the Near East: Jews pray toward Jerusalem, Muslims pray toward Mecca, but Christians pray toward the east. (Easter Sunrise Service//Ezekiel//Tammuz). “Facing East” in liturgical prayer is part of the Byzantine, Syriac, Armenian, Coptic and Ethiopian traditions. It is still the custom in most Eastern rites, at least during the Eucharistic prayer. For this reason, the Vatican Congregation for Eastern Churches declared in 1996 that the ancient tradition of praying toward the East has a profound lithurgical and spiritual value and must be preserved in the Eastern Rites. And he brought me into the inner court of the LORD’s house, and, behold, at the door of the temple of the LORD, between the porch and the altar, were about five and twenty men, with their backs toward the temple of the LORD, and their faces toward the east; and they worshiped the “sun” toward the East.